One of the Norfolk Broads leading boatyards is offering lifejackets for dogs this summer after enquiries from holidaymakers in previous years. 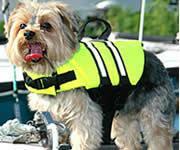 The lifejackets come in three sizes to suit almost any size of dog and are complete with a handle on top to make it easier to get the pooch on and off the boats. Barnes Brinkcraft yard manager Sam Lowe said “We have had people asking about these for a couple of years now and we have ordered several for the coming summer. “A Broads holiday Broads boats is very much a family affair and people are more than welcome to bring their dogs with them and we think we are the only boatyard in the country to do this.